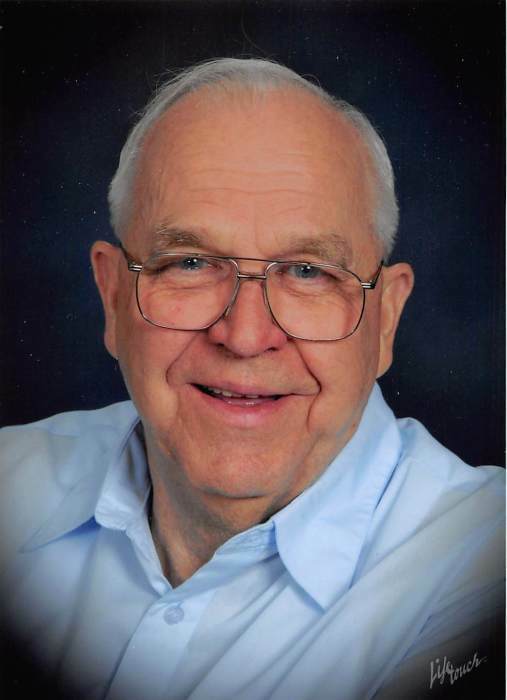 Obituary for James H. Mack | Schaffer Funeral Home, Inc.
James H. Mack, 85, of Defiance, passed away on Wednesday, January 16, 2019 at Park View Nursing Center in Edgerton, Ohio. He was born on December 30, 1933 to Isidore and Catherine (Wood) Mack in Defiance, Ohio. He was a 1953 graduate of Defiance High School. James proudly served our country in the U.S. Army from 1954 to 1956 during the Korean War. On November 9, 1957 he married Carolyn (Wagner) Mack, who resides in Defiance. James was a faithful member of St. John Catholic Church. He served as a eucharistic minister, lector, was a member of the parish council, and sang in the choir. He worked for Brown's Bakery for 32 years until his retirement in 1995. James was a member of VFW #3360 and Knights of Columbus #1039. He volunteered with the Christian Ministry at CCNO, coached boys' minor league baseball, and he was a mentor with the Defiance Schools Mentoring Program. James was an enthusiastic fan of Defiance High School Wrestling. He was a devoted husband, father, grandfather, and great-grandfather, and will be sadly missed by his family and many good friends. James is survived by his loving wife of 61 years, Carolyn Mack of Defiance, his children, Marie (Stephen) Nicely of Ney, OH, Matthew (Marina) Mack of Medina, OH, Judy (John) Mayes of Defiance, William (Lisa) Mack of Waynesville, OH, Michael (Sara) Mack of Mansfield, OH, and Elizabeth Everiss of Walton Hills, OH. He also leaves behind a sister, Ilene Hohenberger of Defiance, 15 grandchildren and 5 great-grandchildren. In addition to his parents, he was preceded in death by a brother, Paul Mack, and sister, Madonna Hahn. Visitation will be held from 2-8 pm on Sunday, January 20, 2019 at Schaffer Funeral Home in Defiance, with a Rosary Service at 2:00 pm. A Mass of Christian Burial will be held at 10:00 am on Monday, January 21st at St. John Catholic Church, with Fr. John Stites officiating. Burial will follow the service at Riverview Memory Gardens, with military graveside rites accorded by VFW #3360. Memorials are suggested to St. John Catholic Church, The Alzheimer's Association, or Great Lakes Hospice. Online condolences can be given at www.Schafferfh.com.